Kovar alloy, a nickel-cobalt-ferrous alloy, is one of the most commonly used glass sealing alloys. This alloy was developed to match the expansion of alkali borosilicate type glasses. Alkali borosilicate glasses are also often referred to as hard glasses and are a popular choice in the electronics industry for producing hermetic glass-to-metal seals. Kovar can also be used as a ceramic sealing alloy for certain applications. One of the challenges when producing glass-to-metal seals is the formation of cracks within the glass, which can lead to loss of hermeticity and/or mechanical failure. The Elan 88 series glass was specifically developed for use with Kovar. As a result, seals formed using this combination outperform competing sealing glasses. 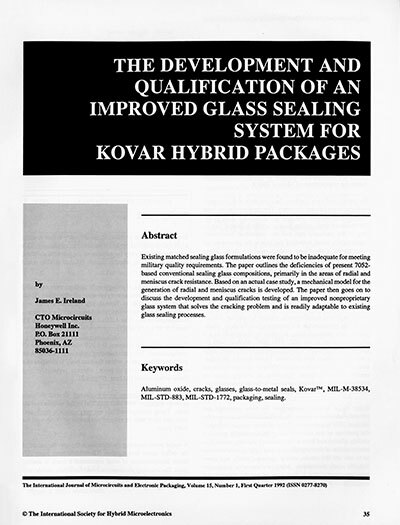 Honeywell performed an exhaustive test comparing various sealing glasses for Kovar sealing glass packages. The report was conducted without our knowledge or participation. However, we are very pleased with the results, which found that Elan Material 88 formulation was superior to all others tested. Below is an excerpt from the conclusions developed by the author based on the research. “The Elan 88 series glass system is a major technical breakthrough for the manufacture of high reliability hermetic metal packages. The material appears to have many redeeming qualities for both the package manufacturer and package customer”. Our Elan 88 series sealing glass can be offered in a wider variety of colors. Our large inventory of over 12,000 tool and die sets allows us to offer customers many configurations without incurring tooling charges. However, where unique geometries are required we have extensive machining capabilities for new tool fabrication. Our experienced Application Engineers can assist you with choosing the right materials for all of your applications. Please contact us for further assistance.